1. During surgery. Your breathing may be stopped with anesthetic medicine and your breathing will be assisted with a ventilator. 2. Drug overdose: The patient took medicine that made him so relaxed that he is in danger of vomiting and inhaling that vomit (aspiration). 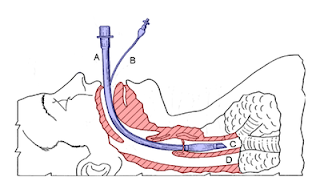 In this way, intubation may be indicated to protect the patient's airway. 3. Neuromuscular paralysis: Some diseases cause the patient to be unable to breathe, and in these cases the patient will require intubation. If the disease is permanant or long term, a tracheostomy may be inserted. 4. Trauma: The patient has been in an accident and is unable to breathe on his own. In these cases intubation may be indicated. 5. Labored breathing: The patient has a disease like asthma, COPD, lung cancer, pneumonia, heart failure, etc. and is having severe trouble breathing. We can intubate these patients so we can breathe for them while we work our magic to fix the underlying cause. 6. Heart attack or head trauma: In these instances, we may need to assist the patient with their breathing so that we can rest their bodies in order to allow our medicines to work their magic. Most intubations are short term, just in long enough until the surgery is complete, or until the disease process is resolved. When a patient is intubated the patient will either be ventilated (breathed for) by an Ambu bag or a ventilator. When this tube is removed it is called extubation.